Research interestsMy research interests lie in understanding trophic interactions in aquatic systems and how both natural environmental perturbations and anthropogenic impacts influence interactions across different levels of the food-web. Ongoing projectPlastics are a large and increasing component of marine litter, threatening marine life. 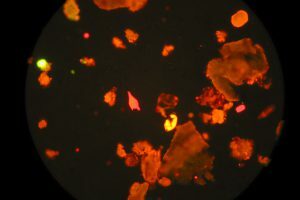 The degradation of plastics leads to an increased build-up of minute plastic particles in the sea (microplastics – MPs), which can be ingested or passively adsorbed by heterotrophs leading to mechanical obstruction of the gastrointestinal tract and inflammatory responses. In autotrophs, exposure to MPs may hamper photosynthesis and change buoyancy. Moreover, the chemical composition and small size make MPs effective sorbents of persistent organic pollutants (POPs) which may be transferred to biota, enhancing regularly occurring bioaccumulation. Despite these concerns, the impact of MPs and their role as vectors mediating POP transport and bioaccumulation in aquatic food webs is largely unknown. In particular, the net effects of MPs in the food webs have not been addressed in a coherent manner yet, and relative contributions of ecological (i.e. inert particles exerting mostly mechanical disturbance for photosynthesis, food uptake and trophic interactions) vs. ecotoxicological (i.e. particles acting as vectors of contaminants and increasing in situ exposure) factors have not been assessed. 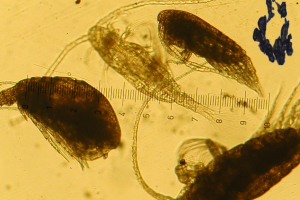 Our aim is to develop and apply an experimental approach for delineating direct effects of MPs on basic physiological functions in model aquatic organisms, and the effects of MPs-associated transfer of POPs. These effects will be examined over several trophic levels spanning from primary producers to top consumers and integrated in a modeling framework. Ogonowski, M; Andersson, K; Hansson, S.
Clevestam, P. D; Ogonowski, M; Sjöberg, N. B; Wickström, H.
Axenrot, T; Ogonowski, M; Sandström, A; Didrikas, T.